“While the incidence of early stage breast cancer has decreased due to mammography, the incidence rates for the killer cancers, (the advanced cancers) have remained stable. While it is true that overall mortality rates have declined slightly, this is attributed to better treatment rather than increased detection.” Dr Laura Esserman. Figure 3 and Figure 4 combined, FIGURE 3 (upper pink line) Annual Age-adjusted Cancer Incidence Rates among Females for Breast Cancer, United States, 1975– 2005. FIGURE 4 (lower pink line) Annual Age-adjusted Cancer Death Rates among Females for Breast Cancers, United States, 1930–2005. The upper pink line (red arrow) is the incidence of breast cancer since 1976. Notice the dramatic increased detection of cases in the early 1980’s with introduction of screening mamography. 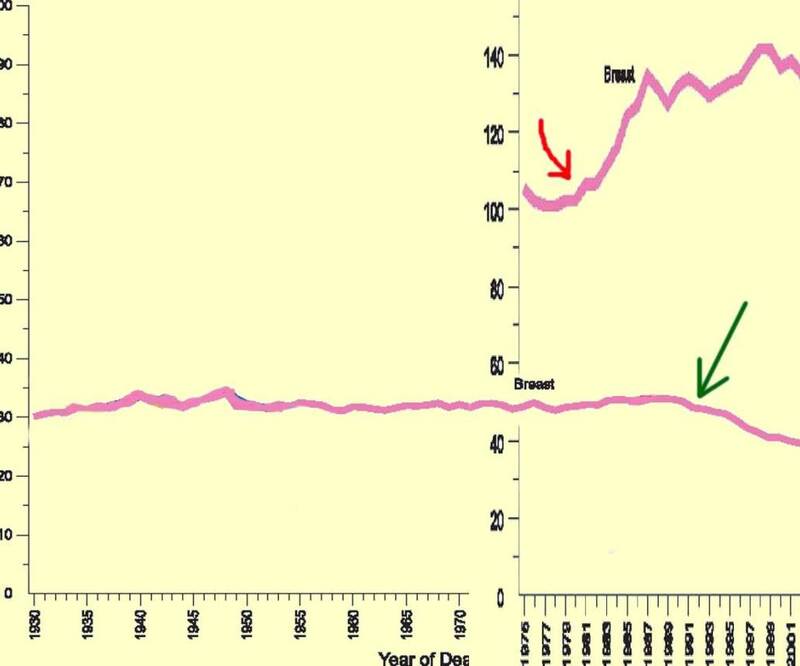 The lower pink line (green arrow) is the annual mortality rate for breast cancer from 1930 to 2006. Note this is stable at about 30 cases per 100,000 women, and declines over the last section (green arrow) to about 25 cases per 100,000. Dr Esserman suggests this rather modest decline in mortality (green arrow) is not due to increased detection with mammography, rather it is due to improvement in treatment. Annual Breast Cancer Mortality – Where’s the Benefit? While the incidence of early stage breast cancer has decreased by 2.8% per year since 2001, incidence rates of advanced (distant-stage) disease have remained stable.(link). In 2009, 192,370 women will be diagnosed with breast cancer and 40,170 women will die of breast cancer. (link) Mammography has increased the detection of very early stage cancer, called DCIS, with 60,000 cases of DCIS detected annually. •1 in 1,000 women annually screened for 10 years will avoid dying from breast cancer. •10 to 15 women will be told they have breast cancer earlier than they would otherwise have been told, but this will not affect their prognosis. 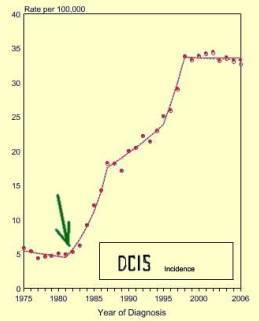 Left chart shows annual incidence of DCIS (ductal carcinoma in situ). Note huge increase in 1983 (green arrow) with introduction of screening mammography. Mammography screening finds the small indolent cancers called DCIS that represent a reservoir of silent disease in up to 18% of the population (at autopsy). This leads to overdiagnosis and overtreatment. For the invasive cancers found in 1-2% of the population (at autopsy series), screening detection is of little help, with little change in the number of advanced cancer cases, and about 40,000 deaths every year. One glaring problem with screening mammography is the detection of DCIS at a rate of 60,000 case per year. DCIS is ductal carcinoma in situ, a pathology diagnosis which carries a very good prognosis, a 98% – 5 year survival with no treatment. In spite of the rather benign natural history of DCIS, mainstream medicine treats these lesions aggressively with surgery and radiation. Recently, the NIH has called for a change in terminology, asking pathologists to stop calling it “cancer”. Left Image : typical appearance of DCIS with punctate calcifications on mammogram (arrow). Courtesy Wikimedia Commons. All three types of cancer, breast, thyroid and prostate have a large reservoir of indolent or biologically insignificant disease that remains silent during the patient’s lifetime. We know this from autopsy studies. One autopsy study of 110 women from Finland using specimen radiographs of thin sections found breast cancer in 20% of the cases. (2 % had invasive cancer, and 18% of the 110 cases had In-Situ Cancer). Spontaneous Remission of Breast Cancer ? One screening study reported by Welch in the Annals of Internal Medicine actually concluded that many small breast cancers spontaneously regress. Gina Kolata wrote a New York Times piece about it. Actually, spontaneous regression of breast cancer has been reported many times in the medical literature. Sir William Osler, a legendary and revered doctor reported 14 cases himself. See this 1901 report: The Medical Aspects of Carcinoma of the Breast, with a Note on the Spontaneous Disappearance of Secondary Growths, OSLER W., American Medicine: April 6 1901; 17-19; 63-66. Perhaps breast cancer remission was more common during his lifetime. I personally have seen a case of spontaneous regression of breast cancer documented by follow up MRI scan. Left Image: Breast Cancer Awareness Month with Pink Ribbons. Courtesy of WIkimedia Commons. The real challenge is for medical science to investigate spontanous regression, and once understood, use it induce a cure in the cancer patient, thereby winning the war against cancer. Perhaps a mouse model discovered in 2003 showing spontaneous regression of advanced cancer in genetically determined mice could help make some progess with this research. This would be a good subject for an NIH grant. We must be careful about the difference between screening, and diagnosis. Screening pertains to mass screening of a healthy population. We had found this leads to overdiagnosis and overtreatment. Diagnosis pertains to evaluation and workup of a symptomatic patient, which is what the doctor does every day. PSA testing, mammography and ultrasound remain excellent diagnostic tools for workup and evaluation of the symptomatic patient. 4) Avoid carcinogenic chemicals, xenoestrogens, pesticides, etc. After 20 years of screening for breast and prostate cancer, several observations can be made. First, the incidence of these cancers increased after the introduction of screening but has never returned to prescreening levels. Second, the increase in the relative fraction of early stage cancers has increased. Third, the incidence of regional cancers has not decreased at a commensurate rate. One possible explanation is that screening may be increasing the burden of low-risk cancers without significantly reducing the burden of more aggressively growing cancers and therefore not resulting in the anticipated reduction in cancer mortality. To reduce morbidity and mortality from prostate cancer and breast cancer, new approaches for screening, early detection, and prevention for both diseases should be considered. Conclusions: Clearly, the diagnosis and management of DCIS is highly complex with many unanswered questions, including the fundamental natural history of untreated disease. Because of the noninvasive nature of DCIS, coupled with its favorable prognosis, strong consideration should be given to elimination of the use of the anxiety-producing term “carcinoma” from the description of DCIS. The outcomes in women treated with available therapies are excellent. Thus, the primary question for future research must focus on the accurate identification of patient subsets diagnosed with DCIS, including those persons who may be managed with less therapeutic intervention without sacrificing the excellent outcomes presently achieved. Essential in this quest will be the development and validation of accurate risk-stratification methods based on a comprehensive understanding of the clinical, pathologic, and biologic factors associated with DCIS. 9 July 2009, BMJ 2009;339:b1425 Editorials. Gilbert Welch MD. Overdiagnosis and mammography screening. The question is no longer whether, but how often, it occurs. Using Autopsy Series To Estimate the Disease “Reservoir” for Ductal Carcinoma in Situ of the Breast: How Much More Breast Cancer Can We Find? H. Gilbert Welch, MD, MPH, and William C. Black, MD ANnals of Internal Med 1 December 1997 | Volume 127 Issue 11 | Pages 1023-1028. The reported incidence of DCIS has increased more than fourfold since 1980 ; this type of cancer now accounts for nearly half of mammographically detected cases of cancer [8, 9]. Whereas the two series with the highest prevalence (both of which were performed by the same investigators) were the most assiduous: The investigators examined 95 and 275 specimens per breast after being guided by radiographs of each 5-mm section. Breast cancer and atypia among young and middle-aged women: a study of 110 medicolegal autopsies. M. Nielsen, J. L. Thomsen, S. Primdahl, U. Dyreborg, and J. A. Andersen Department of Pathology, Frederiksberg Hospital, Copenhagen, Denmark. In 110 consecutive, medicolegal autopsies of young and middle-aged women (range 20-54 years) the breasts were examined by an extensive histopathologic method and by correlative specimen radiography. Malignancy was found in 22 women (20%) of which only one was known to have had clinical invasive breast cancer (IBC). At autopsy 2 women had IBC (2%), the remaining in situ carcinoma (in situ BC) of microfocal type (18%), i.e. 15 (14%) intraductal carcinomas (DCIS), 4 (3%) lobular carcinoma in situ (LCIS) and one (1%) both DCIS and LCIS. breast cancer facts and figures 2009 ACS. Stage: Figure 5b (page 7) presents incidence trends by race and stage at diagnosis. The incidence of regional-stage disease increased during 1994-2001 and has since decreased on average by 2.8% per year. Incidence rates of distant-stage disease have remained stable. It is estimated that 192,370 women will be diagnosed with and 40,170 women will die of cancer of the breast in 2009. Breast Cancer Mortality Rates Continue to Decline. According to a report issued by the American Cancer Society, breast cancer death rates in the United States continue to decline by more than 2% per year. This and other breast cancer statistics were published in Breast Cancer Facts & Figures 2009-2010. Source: US Mortality Data, 1990 to 2006, National Center for Health Statistics, Centers for Disease Control and Prevention, 2009. It is estimated that 192,370 women will be diagnosed with and 40,170 women will die of cancer of the breast in 2009. Table I-1 (http://seer.cancer.gov/csr/1975_2006/results_single/sect_01_table.01.pdf). Saving Women From Breast Cancer: Are Mammograms Really the Answer?By Naomi Freundlich, Health Beat. Posted October 21, 2009. “For every 2,000 women [age 50-69] invited for screening throughout 10 years, one will have her life prolonged. In addition, 10 healthy women who would not have been diagnosed if there had not been screening, will be diagnosed as breast cancer patients and will be treated unnecessarily. It is thus not clear whether screening does more good than harm. February 19, 2009. Breast cancer screening peril. Negative consequences of the breast screening programme. Peter C. Gøtzsche and his colleagues from the independent Nordic Cochrane Centre. They describe a synthesis of published papers that quantify the benefits and harms of screening using absolute rather than relative numbers that make it easier to comprehend. They conclude as follows: if 2,000 women are screened regularly for ten years, one will benefit from the screening, as she will avoid dying from breast cancer. At the same time, ten healthy women will, as a consequence, become “cancer patients” and will be treated unnecessarily. Clearly, Dr. Kramer was suggesting that early detection had failed to live up to its promise. “If screening worked perfectly,” the article continues, “every cancer found early would correspond to one fewer cancer found later. That, he (Kramer) said, did not happen. Mammography, instead, has resulted in a huge new population of women with early stage cancer but without a corresponding decline in the numbers of women with advanced cancer.” The modest size of the reductions in later stage cancers and the unchanged status of metastatic disease are troubling. It appears that the early-detection approach to reducing cancer mortality fails to take into account the reality that some tumors are so aggressive that even the earliest detection will fail to eradicate them, while others are so indolent that it seems to make little difference if they are found before they become palpable. The burden of advanced breast cancer shows no real sign of abating, and is likely to continue and even increase as treatments prolong life. In Figure 7, the SEER data for 25-year breast cancer incidence rates by stage, as well as death rates, are presented in graphic form. The top line, representing localized breast cancer clearly shows the precipitous rise begun in the early 1980s, with the dashed reddish line indicating the trend. The other clearly ascending line, accompanied by a dashed reddish line, is for in situ breast cancer, also associated with increased mammography screening. The dashed purplish trendlines for both the regional breast cancer rates and deaths show only slight decreases. There has been no change in the rate of distant (metastatic) breast cancer diagnosed over twenty-five years. Spontaneous Remission. largest database of medically reported cases of spontaneous remission in the world, with more than 3,500 references from more than 800 journals in 20 different languages. The consulting physician sees mammary cancer at two stages of its progress. Dreading the surgeon, and hoping against hope, a number of women prefer to come to him at the first detection of a tumor. But these form a small fraction of the cases. A large majority are the unhappy victims of the internal metastases after operation. For some years I have been interested in this class of cases, and have collected material bearing upon the question of these late, and more strictly medical, manifestations of the disease.In this paper, fourteen cases of carcinoma of the breast are reported in which there were secondary growths and in some cases the secondary growths spontaneously disappeared. Proc Natl Acad Sci U S A. 2003 May 27; 100(11): 6682–6687. Spontaneous regression of advanced cancer: Identification of a unique genetically determined, age-dependent trait in mice. Zheng Cui et al. The reader is advised to discuss the comments on these pages with his/her personal physicians and to only act upon the advice of his/her personal physician. Also note that concerning an answer which appears as an electronically posted question, I am NOT creating a physician — patient relationship. Although identities will remain confidential as much as possible, as I can not control the media,I can not take responsibility for any breaches of confidentiality that may occur. 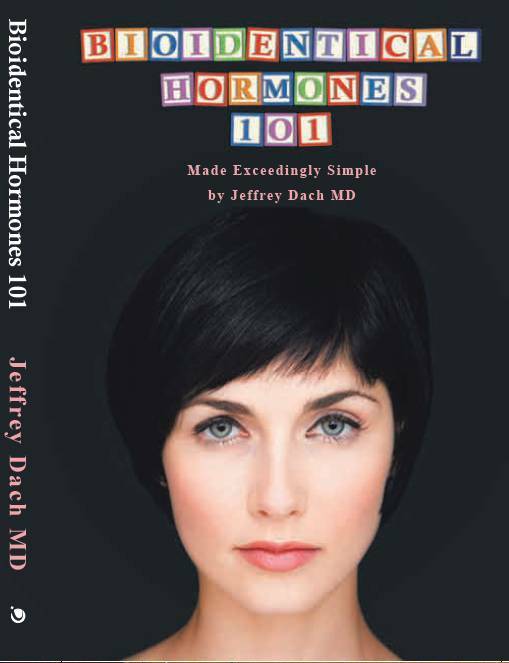 Copyright (c) 2009-2013 Jeffrey Dach MD All Rights Reserved. This article may be reproduced on the internet without permission, provided there is a link to this page and proper credit is given. All of these troubling issues with mammography have been extensively covered in a new, independent investigation of mammograms (read “The Mammogram Myth: The Independent Investigation Of Mammography The Medical Profession Doesn’t Want You To Know About” by Rolf Hefti. Also see http://www.supplements-and-health.com/mammograms.html). Undoubtedly, profits, system justification, and politics keep the real facts hidden from women.